Last I heard of Qwel was when he opened for Mos Def and "DOOM" at their Chicago show in February. His solid set was one of the few highlights of that disastrous night and I remember wondering when we would be blessed with a new release from this prolific rapper. Little did I know that he and local producer “Maker” was already working on another collaboration album. I had heard nothing about "Owl" prior to hearing the album snippets the other day so it really took me by surprise when I finally heard it. The Chicago-based duo has made a couple of albums together before this new release but this may be their strongest and most cohesive effort thus far. The stark, melancholy, funky & verbose tracks they've been known for are fully present here and this 3rd collaboration helps prove that these two have an undeniable chemistry that should be explored more often. And I'm not sure if it's Maker or another dj behind the decks but this album also has some of the best scratches I've heard in awhile. There's tons of highlights on this album (the how-to-rap song "Cookie Cutter" could give eLZhi's "The Art of Patterns" Video a run for it's money) but you're lucky cuz you'll be able to listen to most of them thanks to the snippet mix they've put up for free download on their bandcamp. 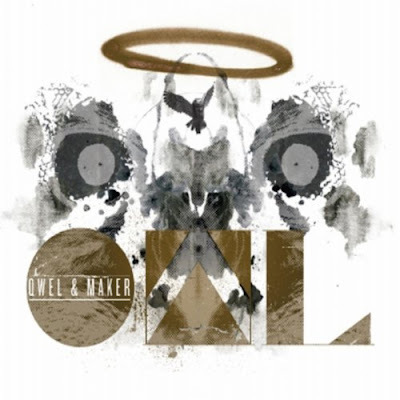 Listen to the album on G4's site and download their mix at the link below and remember to cop Qwel & Maker's album "Owl" on September 14, 2010. Another dope album from Qwel & Maker.